Americans had been celebrating “thanksgivings” in one form or another for a long time before the Civil War, but it wasn’t until Lincoln’s presidency that the holiday acquired a sort of official seal of approval and a standardized date, at least on the national level. In response to pleas from editor Sarah Josepha Hale (who had been petitioning for such a national holiday for years), on October 3, 1863 Lincoln set aside the last Thursday in November as a national Thanksgiving Day. The country followed this practice until the presidency of Franklin Roosevelt, who wanted an earlier date to accommodate a longer holiday shopping season. Congress eventually settled on the fourth Thursday in November. Lincoln’s October 1863 proclamation helped transform Thanksgiving from a holiday limited to certain states and practiced on various days into a genuinely national custom. Interestingly, Lincoln probably didn’t write it himself; one of his secretaries credited it to William H. Seward. We’ve featured the proclamation on this blog before, but since this year marks the sesquicentennial of Thanksgiving as an “official” United States holiday, it seems appropriate to post the text again. Members of both major parties were eager to claim Lincoln, the first Republican president. Only 23 percent of those surveyed said Lincoln would be a member of the present-day Republican Party, but that included 55 percent of the Republicans surveyed, while only 7 percent of Democrats said he would be in the GOP. Just under one-third of the total group said Lincoln would be a Democrat, while many said either he would be an independent or were unsure. I didn’t really start taking the Gettysburg Address seriously until one day when I was in grad school, trying to figure out how to finish a paper while eating a roast beef sandwich. I was enrolled in a seminar on the early national period, and my professor had told us to write an essay answering the following question: Who was more prescient, Alexander Hamilton or Thomas Jefferson? Of these two men who had very different visions of what America should be, which one saw the country’s future direction more clearly? My instinct was to go with Hamilton. In terms of policy, he was probably the most forward-looking of all the Founders, envisioning a United States with a vigorous, centralized government and a modern, diversified economy. The overall course of American history has been in this direction, especially since the late nineteenth century. I knew that I’d probably end up hedging a little, noting that while Hamilton was more prescient in terms of the way America has operated, Jefferson was more influential in terms of Americans’ self-definition. But that answer seemed a little wishy-washy. I wanted to come up with some sort of definitive answer. So I was sitting at an Arby’s restaurant, trying to knock out an outline for the paper while getting a bite to eat, when I figured out how to give both Hamilton and Jefferson their due. Neither man was totally correct. It was Abraham Lincoln who understood America most clearly, because at Gettysburg he reconciled these two different visions of the nation so that each one supported the other. Lincoln oversaw a Hamiltonian war—a war of national consolidation, and a war that would result in a more commercial nation with a more vigorous central government—but he did it to achieve Jeffersonian ends. Indeed, he did it while invoking Jefferson, chapter and verse. In 1863, the American experiment to work out this “abstract truth”—an experiment only “four score and seven years” old—would either survive and vindicate government of the people, or it would collapse and call the whole enterprise of popular government into question. If a minority could dissolve the Union due to the outcome of an election, democracy by majority rule was unworkable. To Lincoln, secession was therefore an existential threat to democratic government itself. The stakes in the Civil War were breathtakingly high. The survival of popular government was what the men buried at Gettysburg had given “the last full measure of devotion” to defend. Lincoln thus believed that the Hamiltonian tools of a consolidated Union and an active national government were necessary to secure the Jeffersonian principles of liberty and equality. These tools would also be the means to extend these Jeffersonian ideals to the enslaved. The war would not only secure what the Founders had gained, but finish what they had left undone by resolving the great American contradiction of slavery in a nation dedicated to freedom. 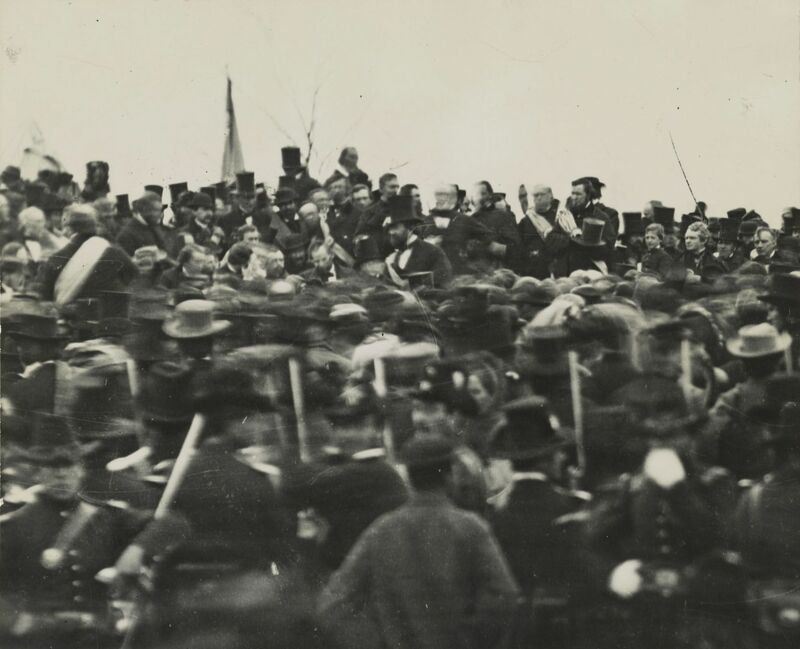 Rather than merely dedicating a cemetery, Lincoln explained the meaning of America, defined the purpose of the war, paid tribute to the dead, exhorted his audience to continue their struggle on behalf of freedom, and reconciled the two seemingly contradictory American impulses of Union and liberty. And he did it in less than three hundred words. LMU’s Abraham Lincoln Library and Museum is hosting a special “Music of Gettysburg” program on Friday, November 15 at 7:00 P.M. Narrated by acclaimed Lincoln impersonator Dennis Boggs, this event commemorates the 150th anniversary of the Gettysburg Address. For more information, call the museum at (423) 869-6439.